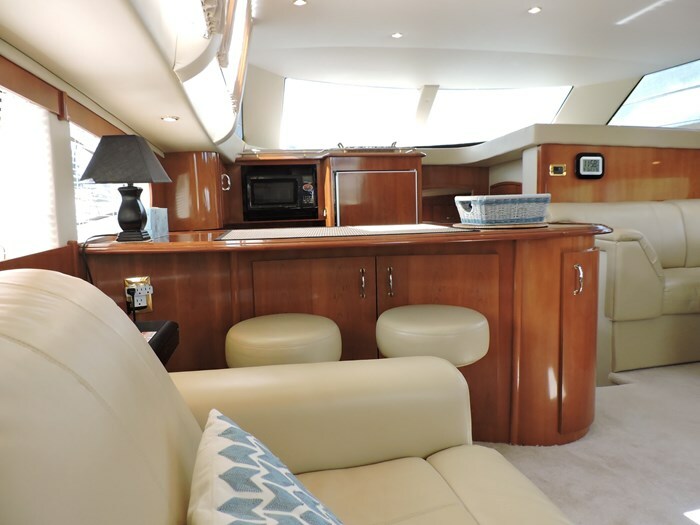 bar, flatscreen TV and Sony entertainment center creates a nice living and entertaining area. 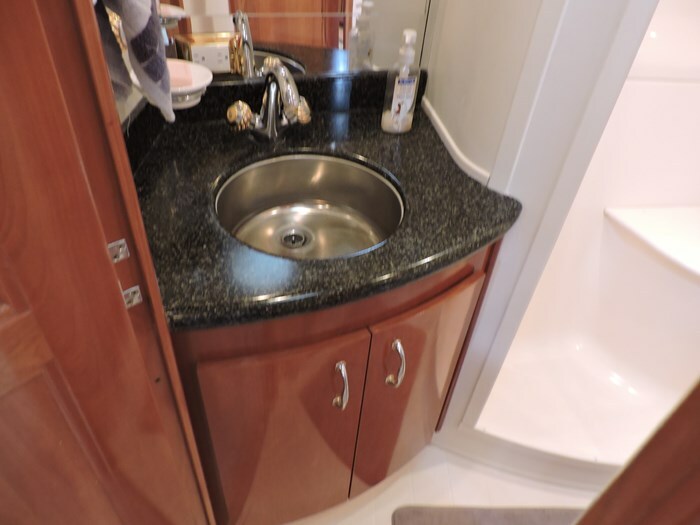 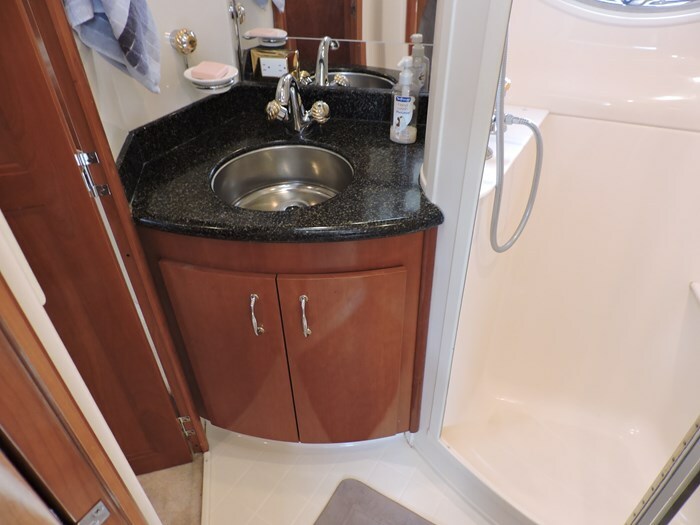 The master stateroom aft features a walk- around queen berth, ensuite head with separate shower stall and lots of hanging and storage space. 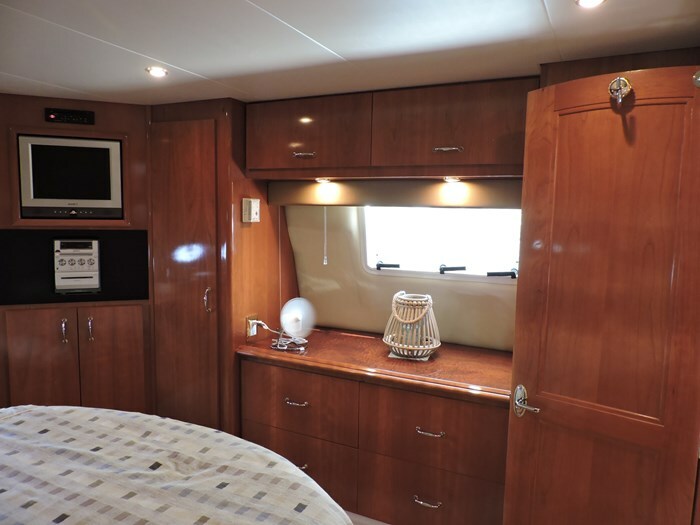 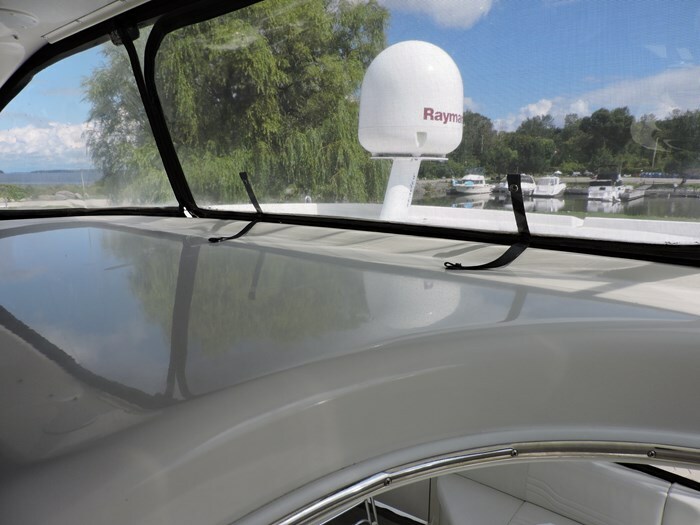 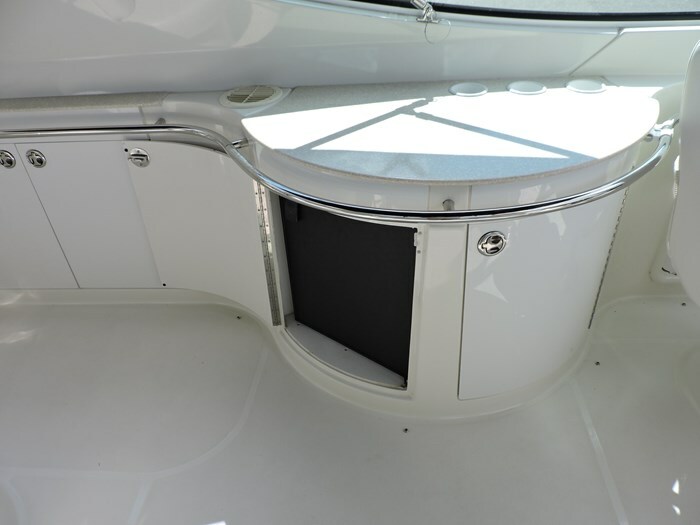 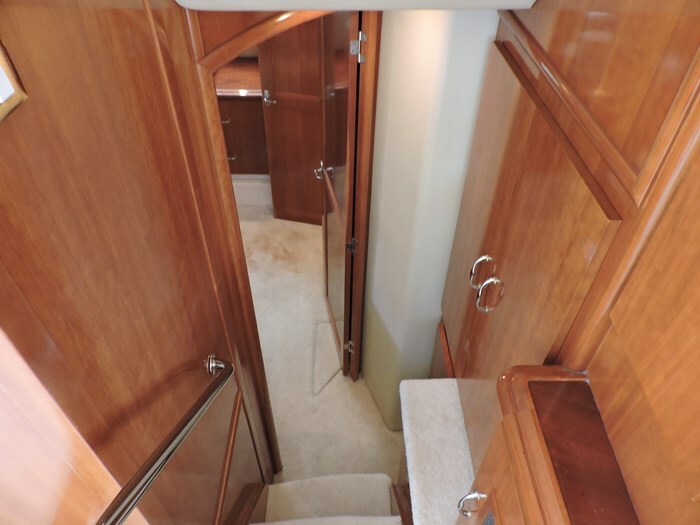 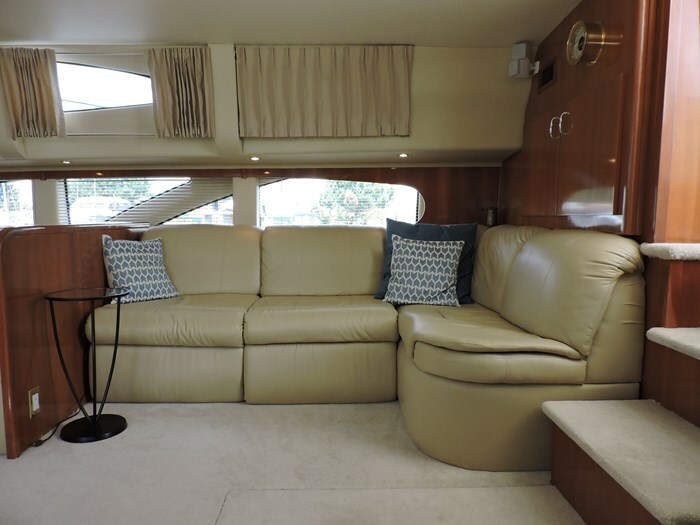 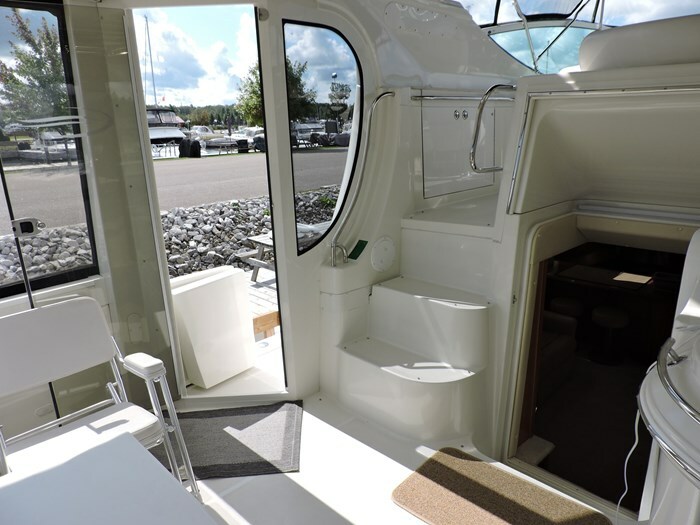 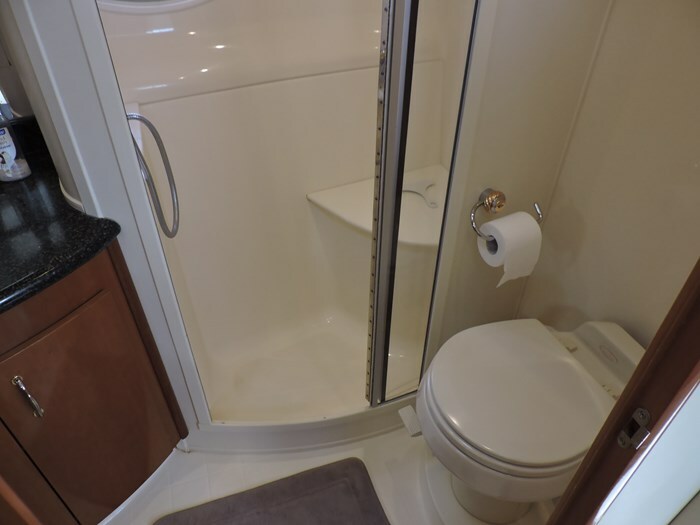 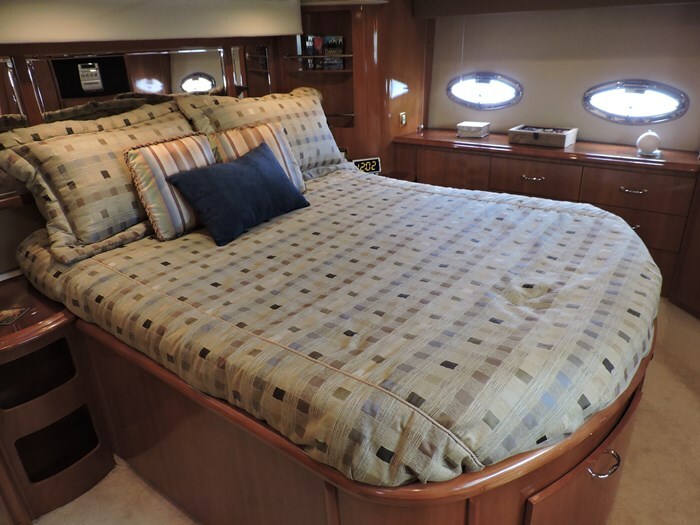 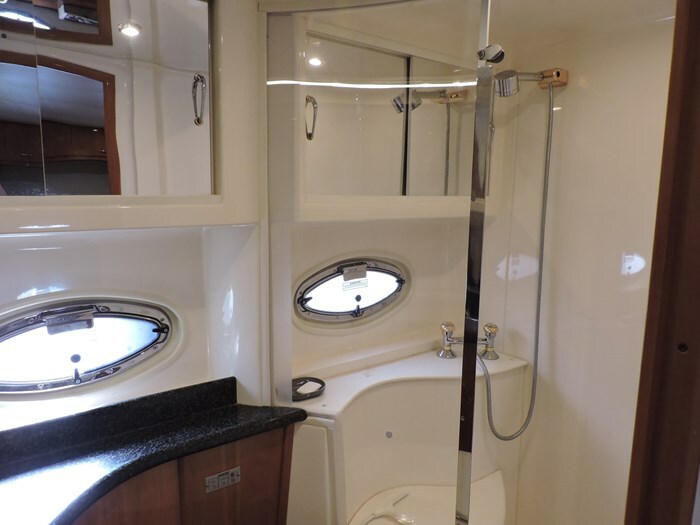 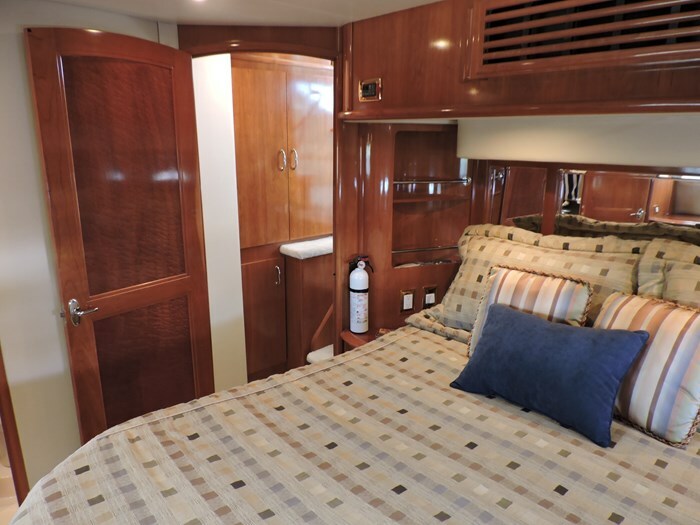 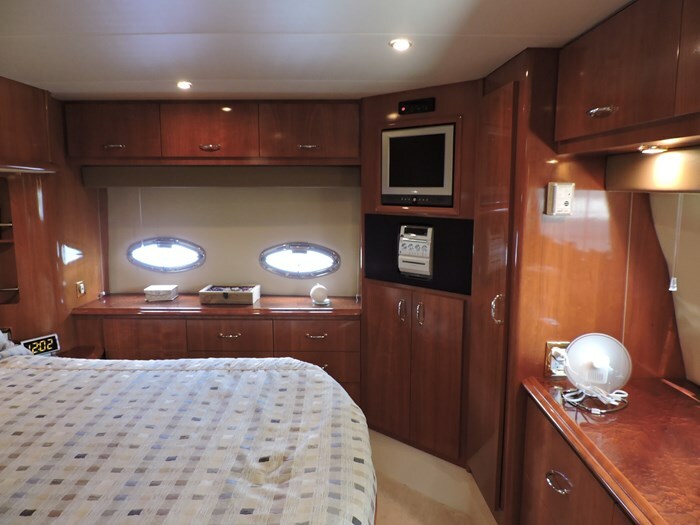 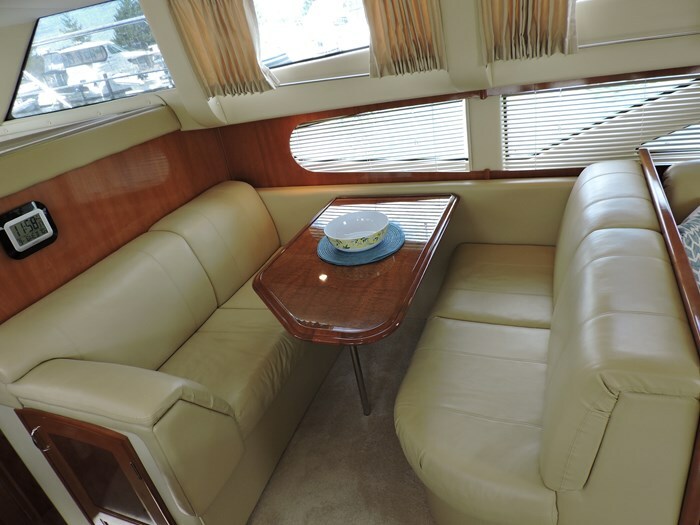 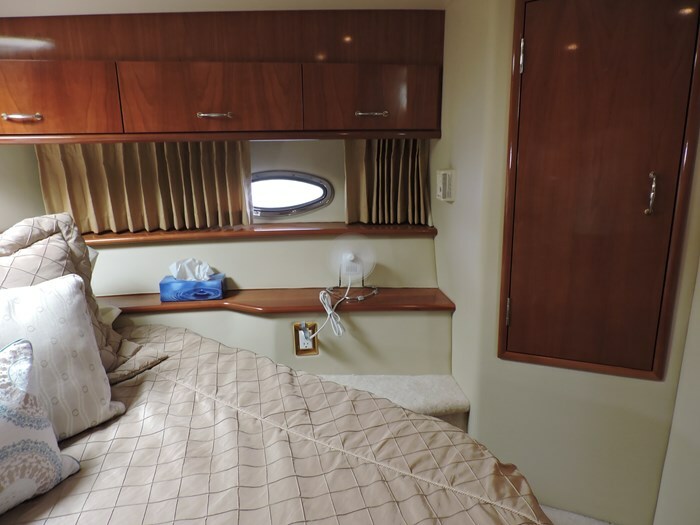 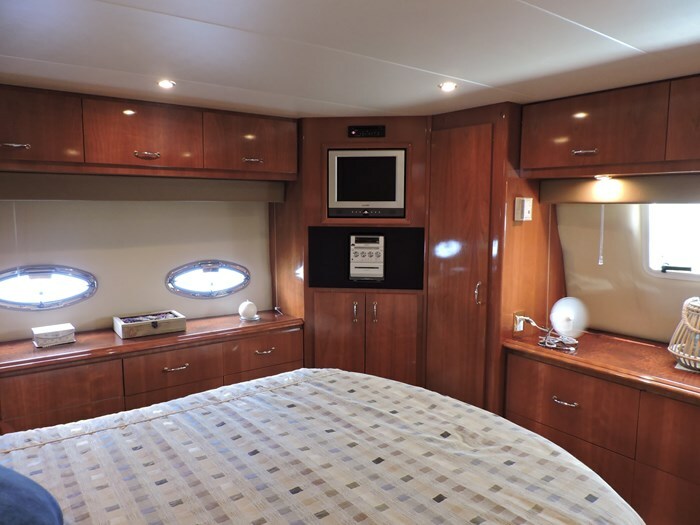 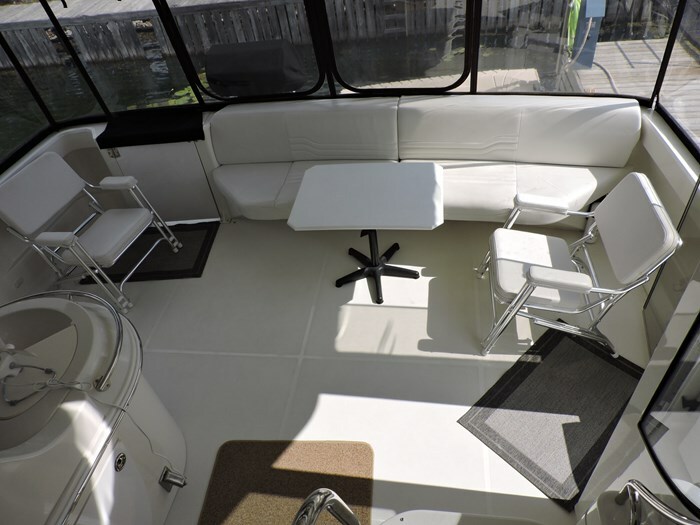 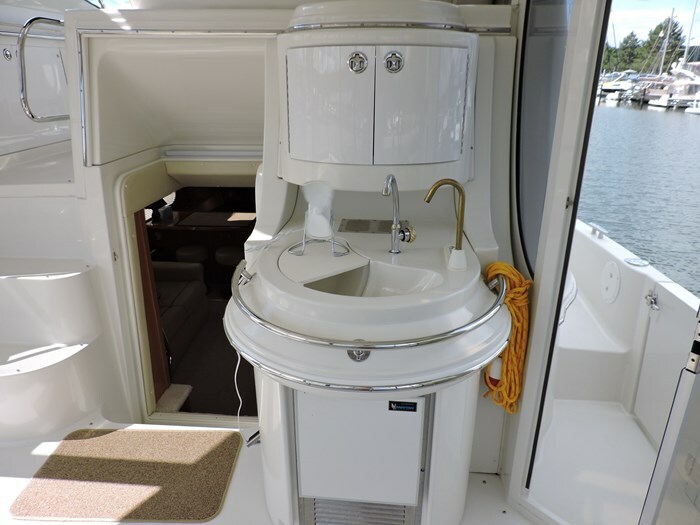 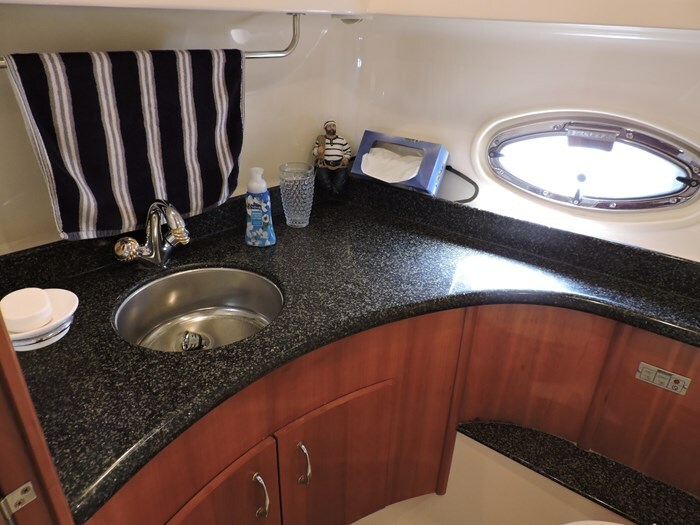 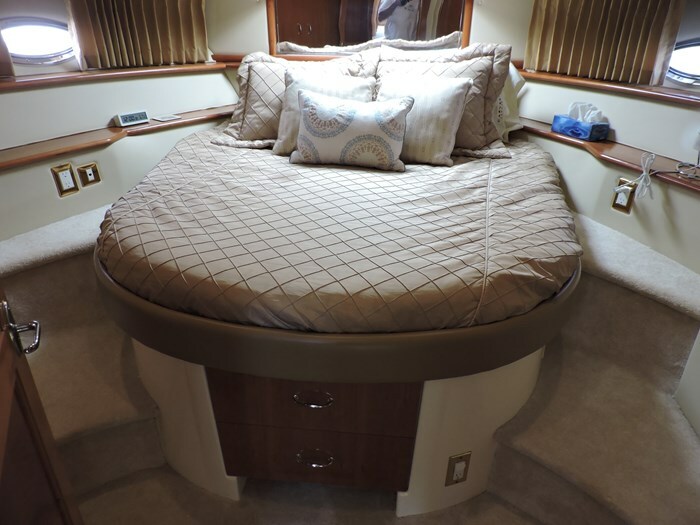 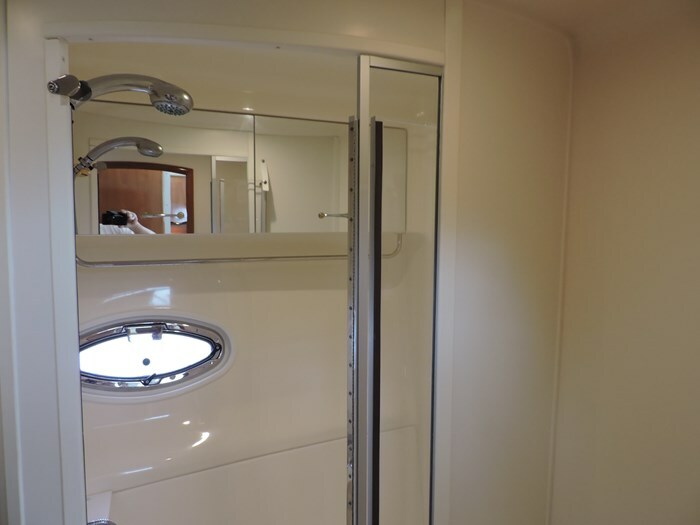 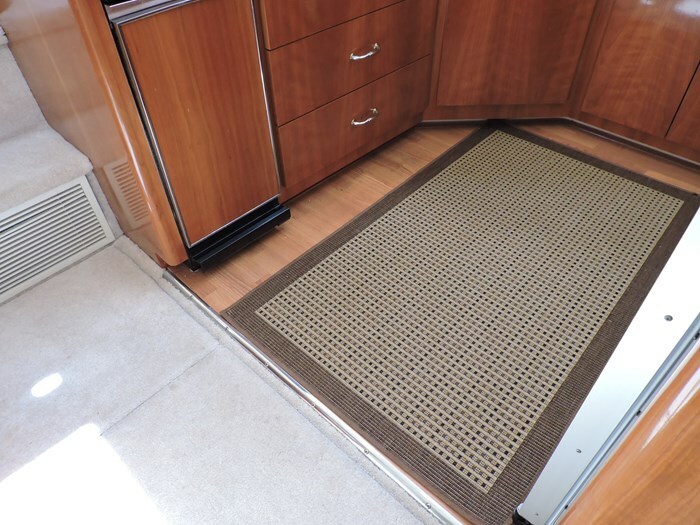 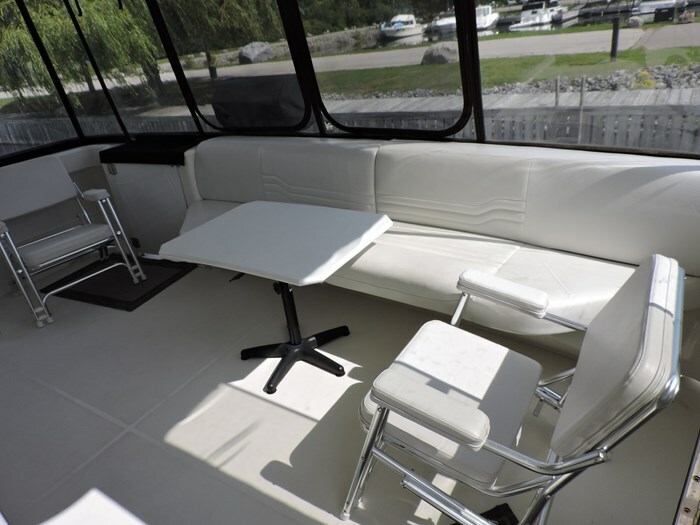 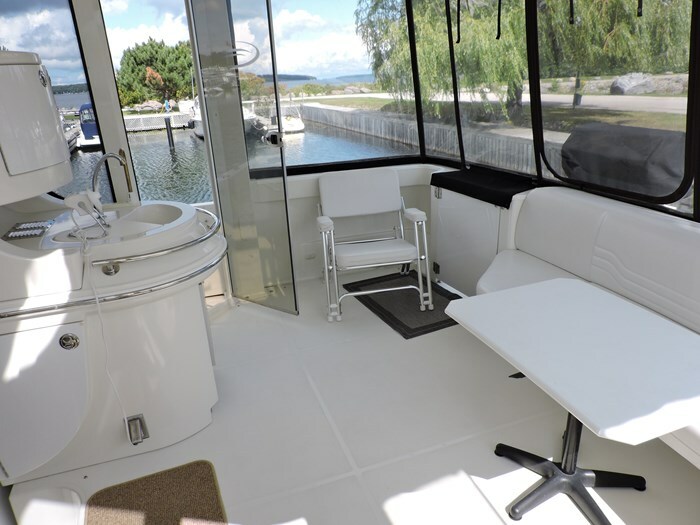 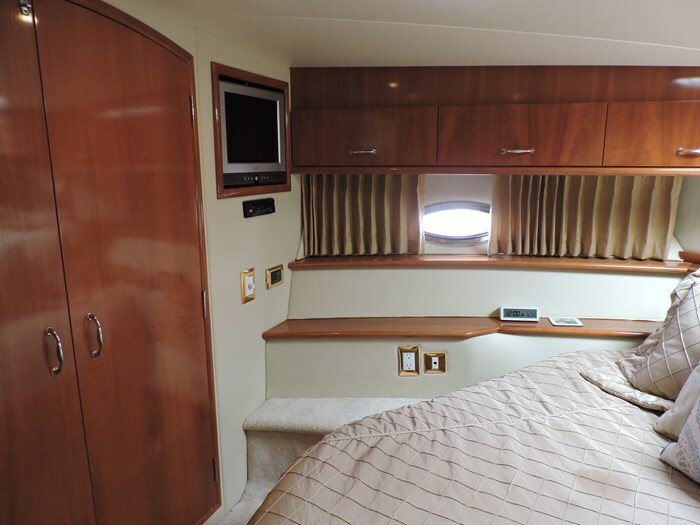 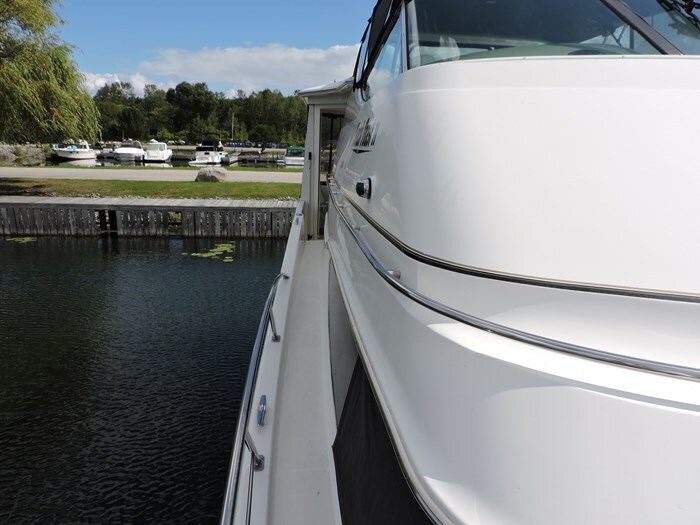 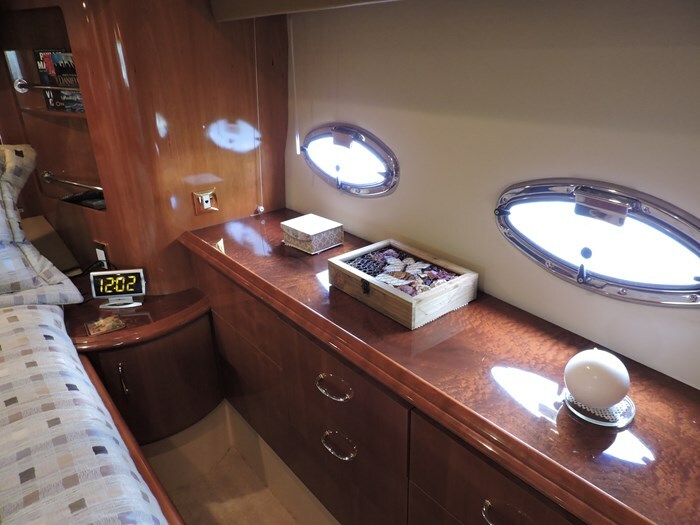 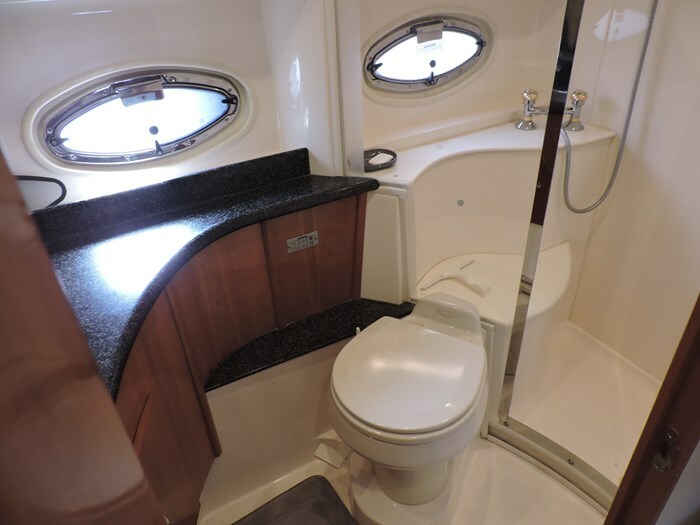 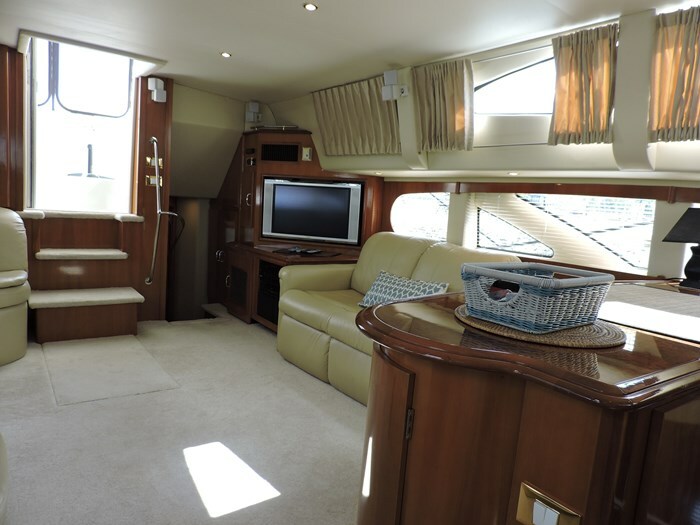 The forward VIP berth features a centerline queen berth, a huge hanging locker with built in shelves and private entrance to the guest head. 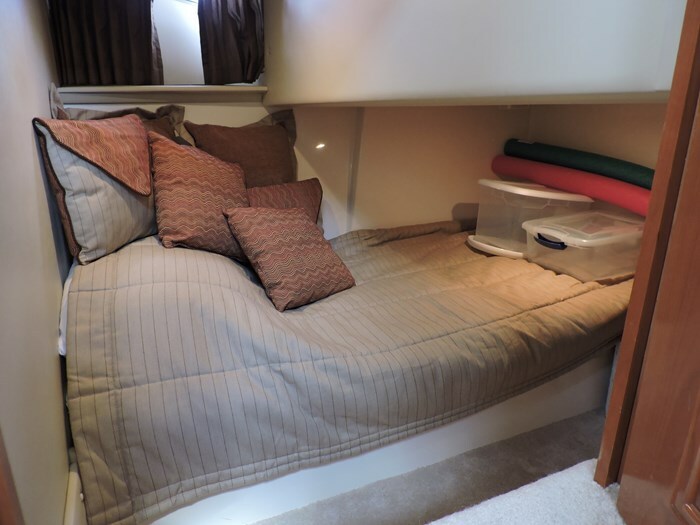 The third stateroom features a single berth, privacy door and two storage compartments and a hanging locker. 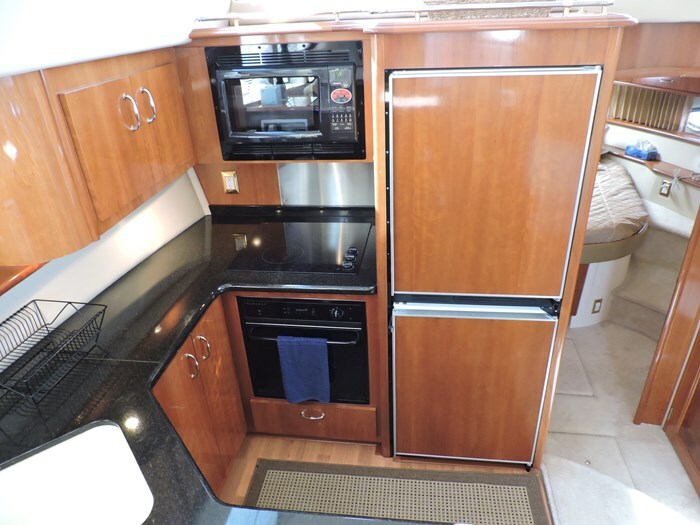 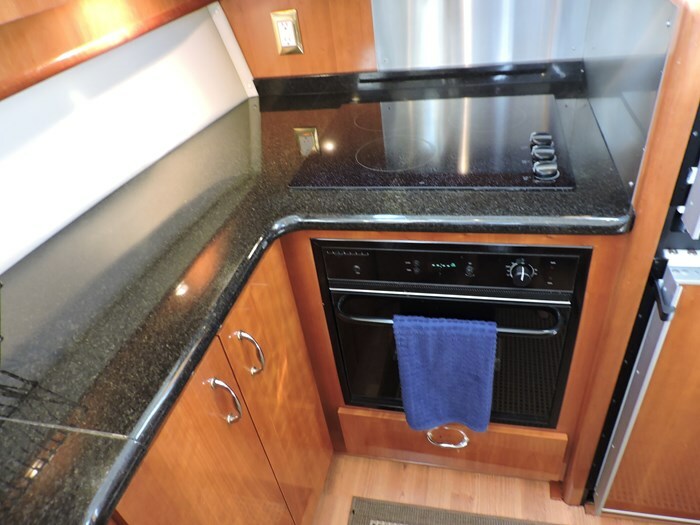 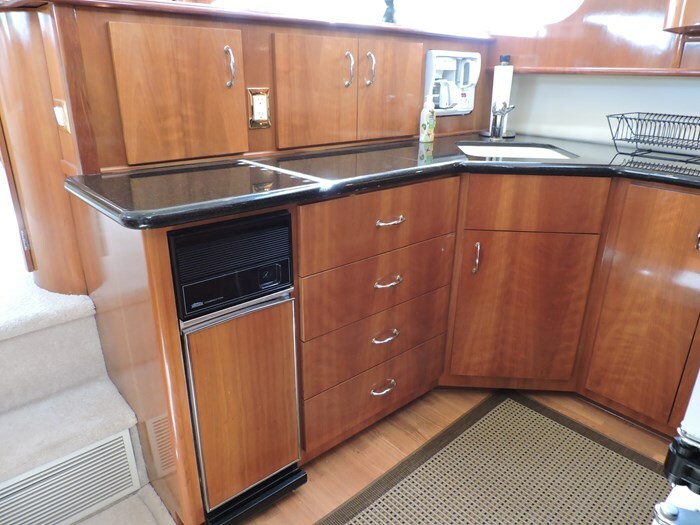 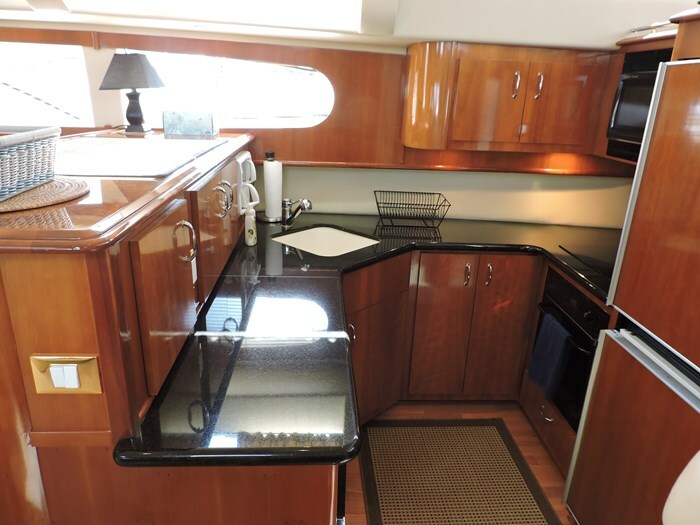 The fully equipped, gourmet galley features a SubZero refrigerator and SubZero freezer, 3 burner flush top electric stove, convection microwave, and tons of storage areas. 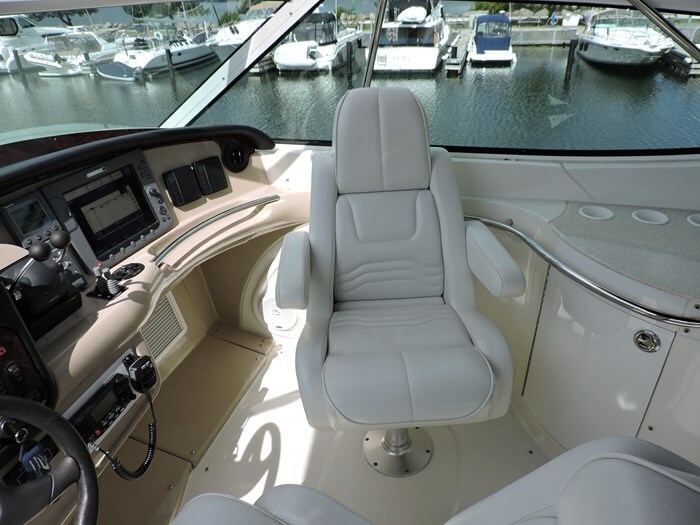 bucket seats at the helm. 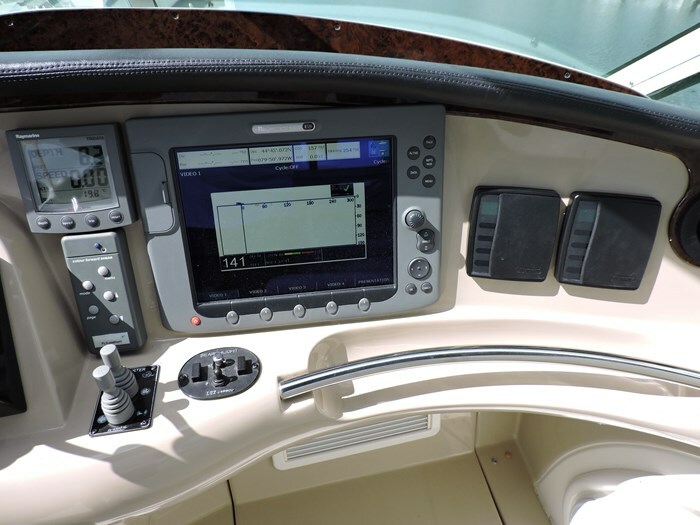 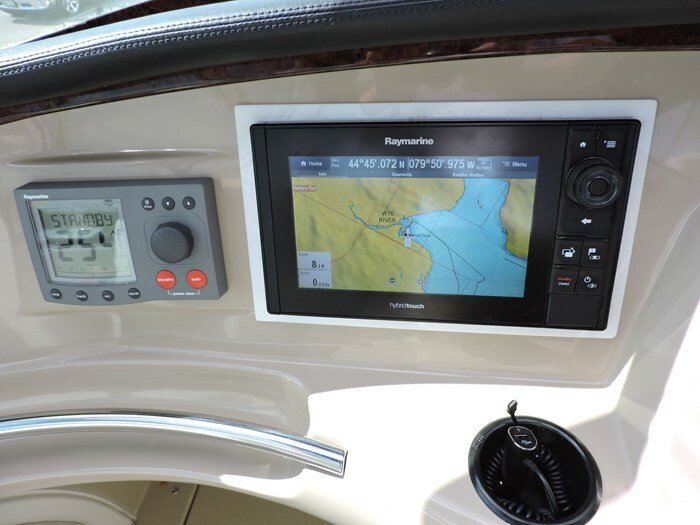 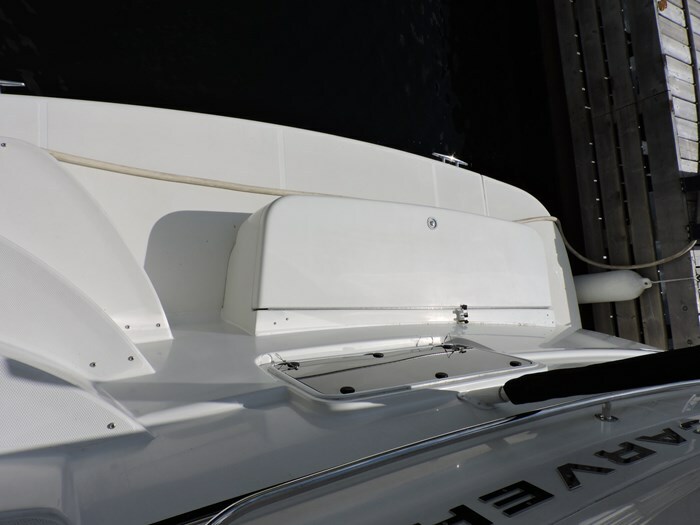 The air conditioned bridge has a complete electronics package including radar, autopilot, GPS plotter, forward looking sonar depth sounder. 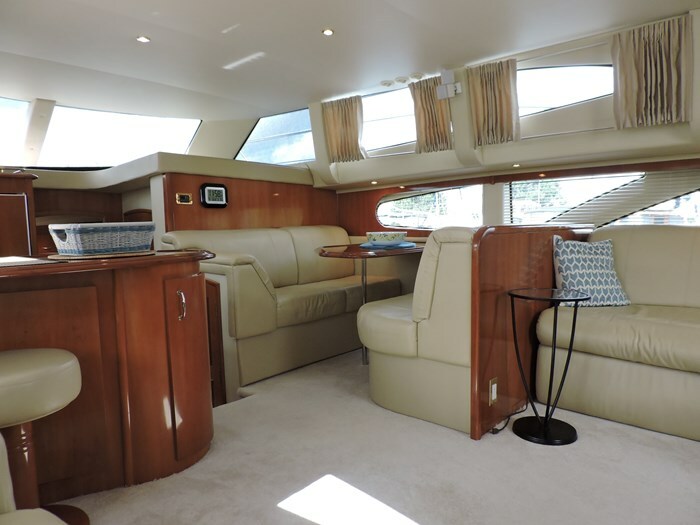 Twin Volvo diesels with 480hp each cruise this big yacht at 19 knots all day long. 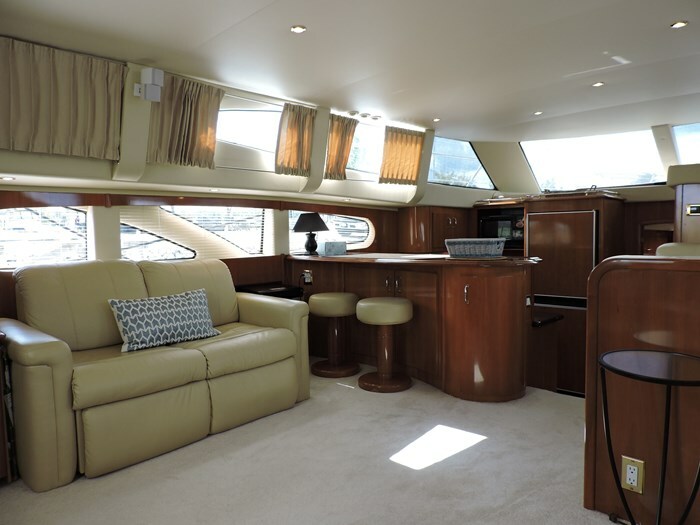 The Carver dealer replaced all interior and exterior carpets, the Carver linen and towels sets and recovered the ultra leather sofas in 2007. 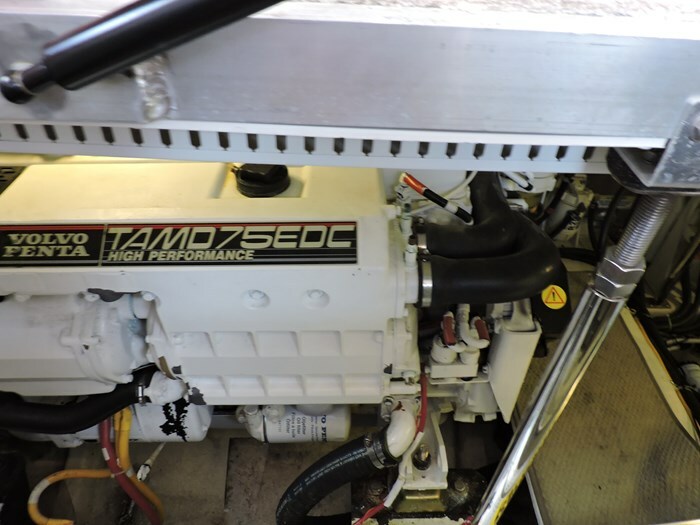 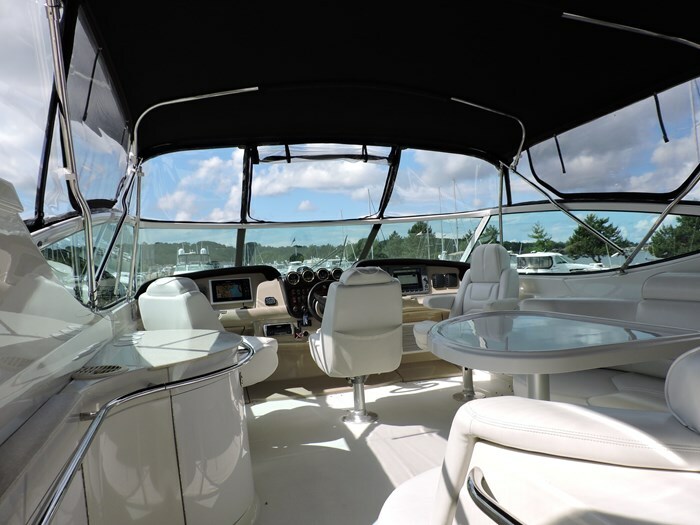 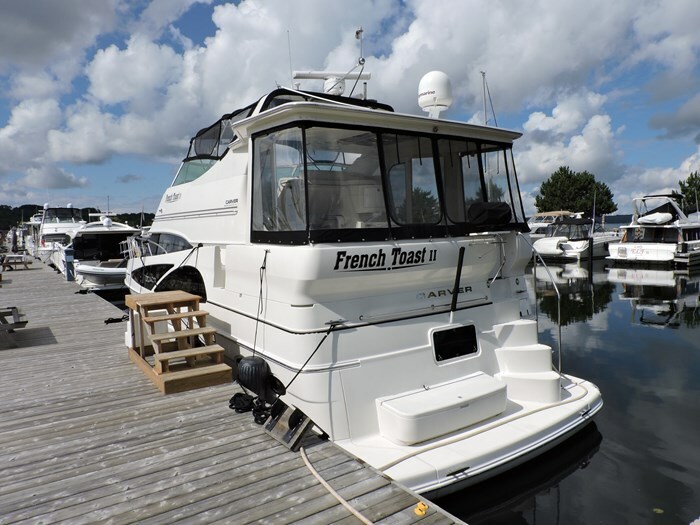 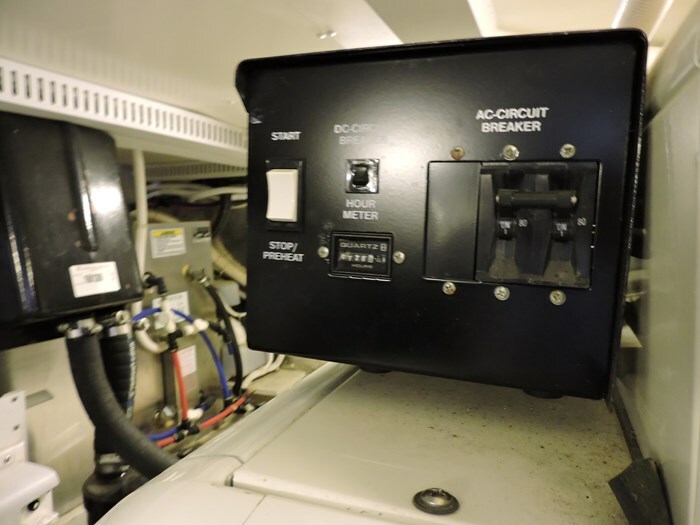 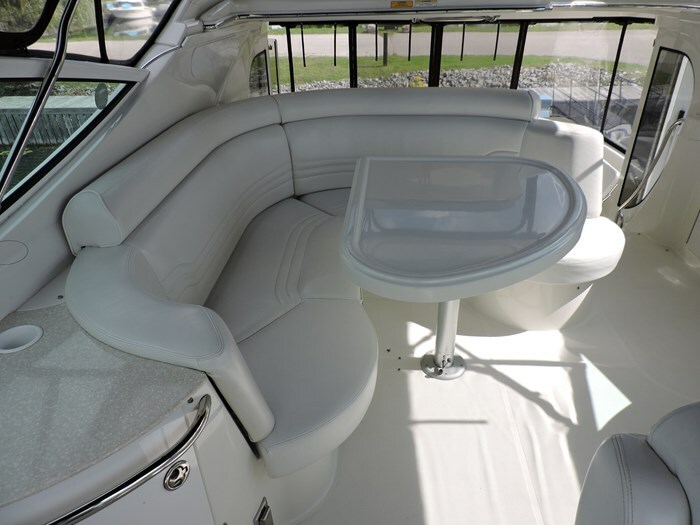 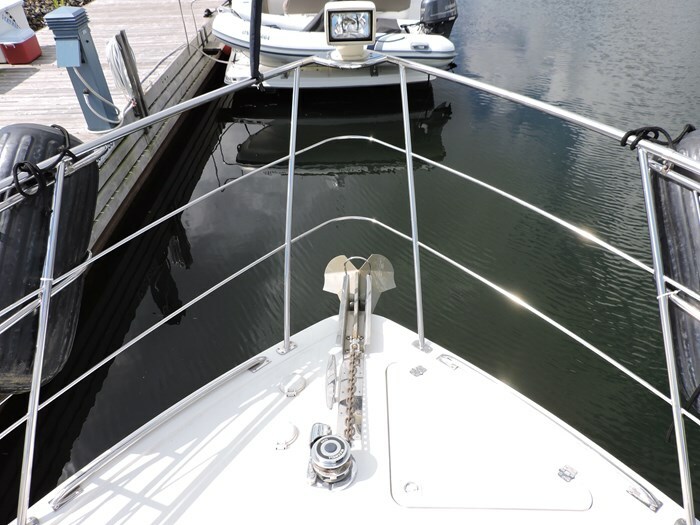 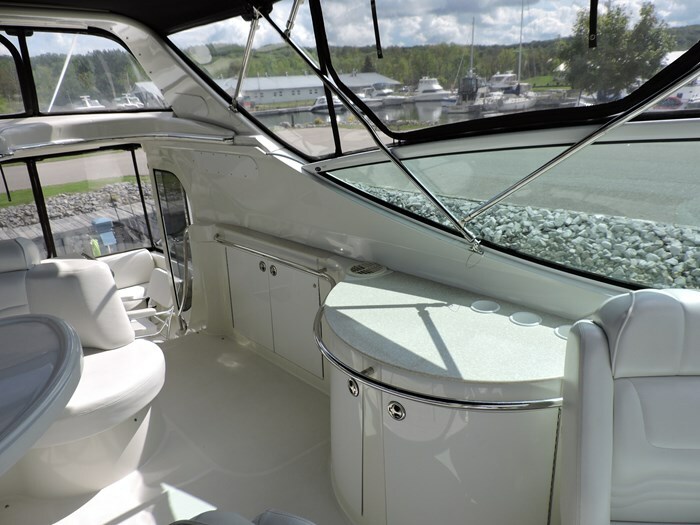 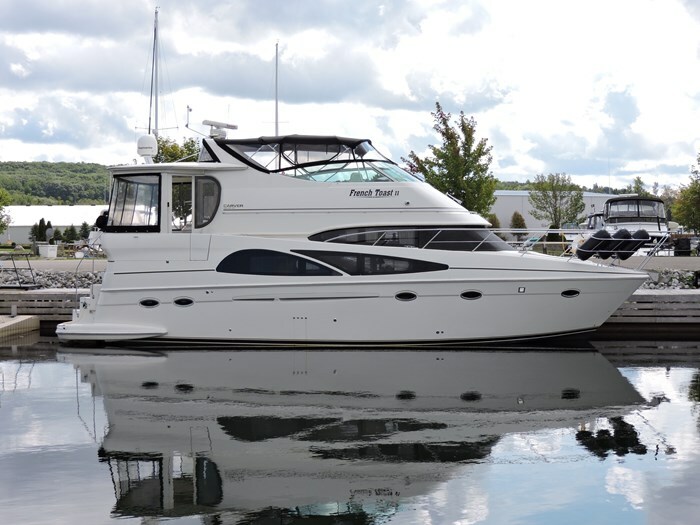 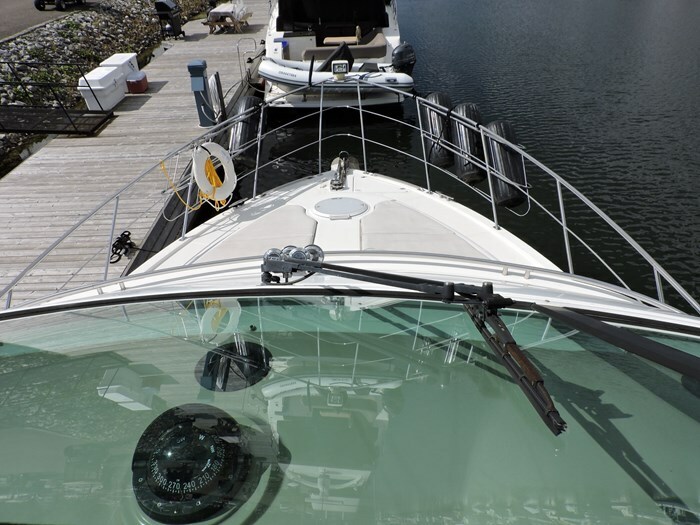 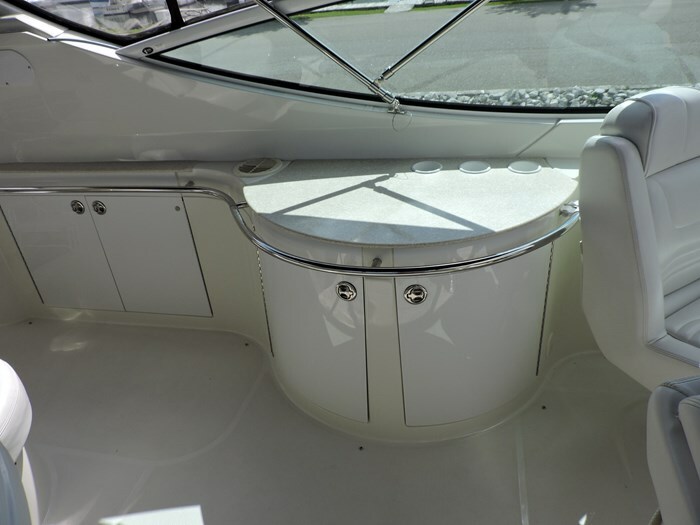 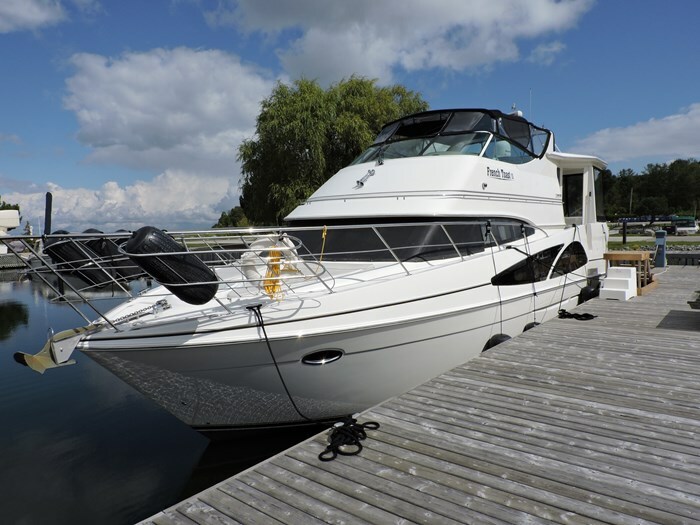 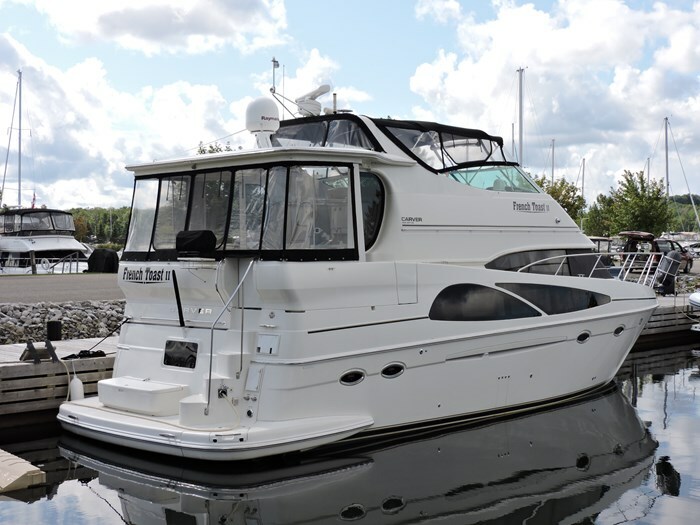 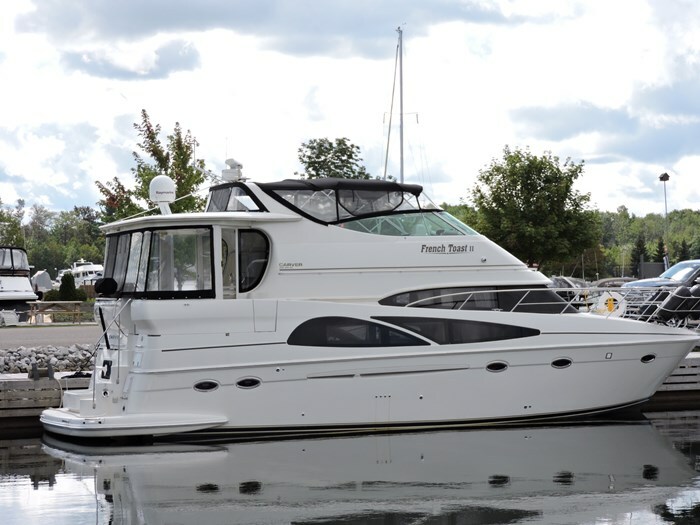 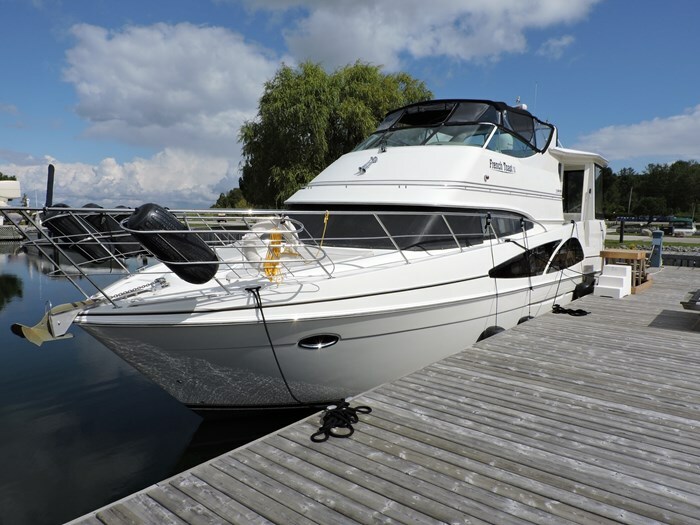 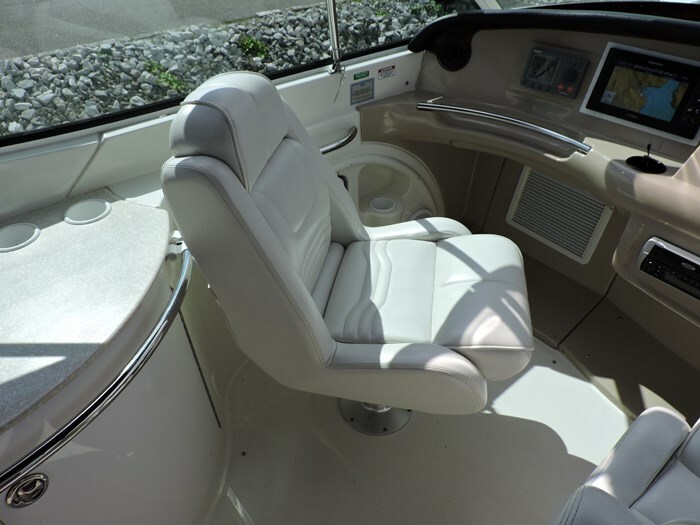 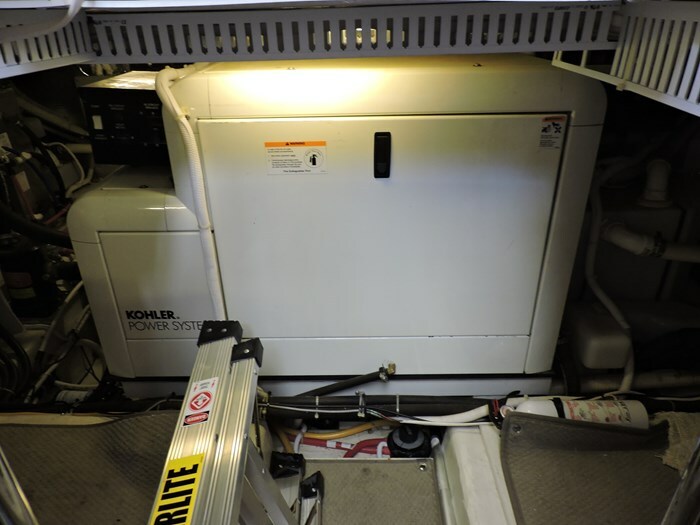 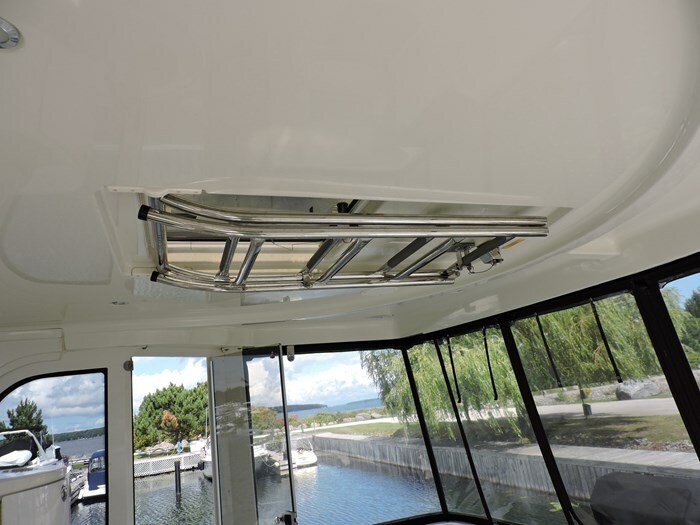 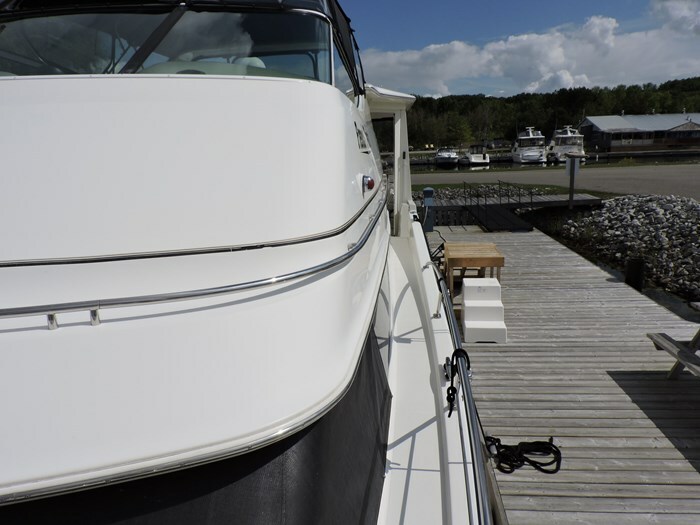 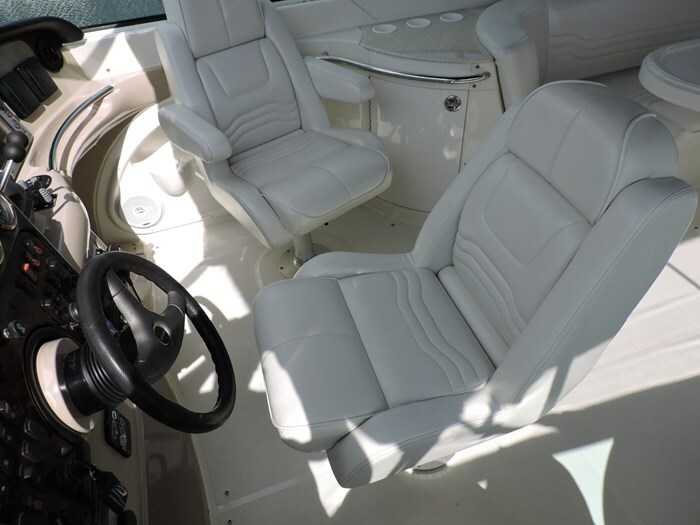 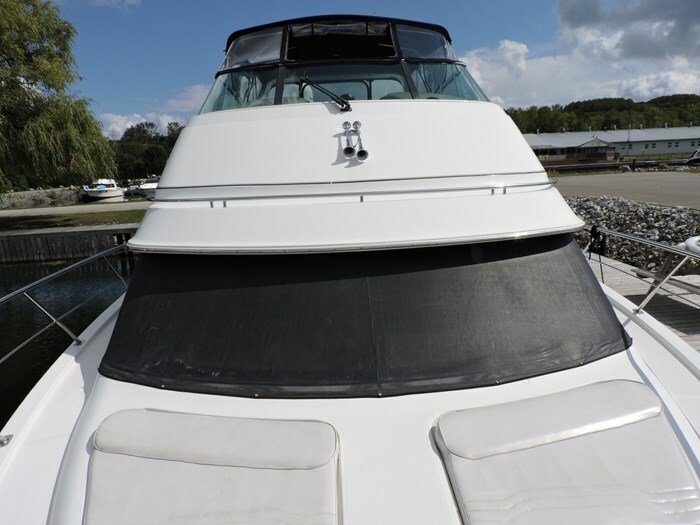 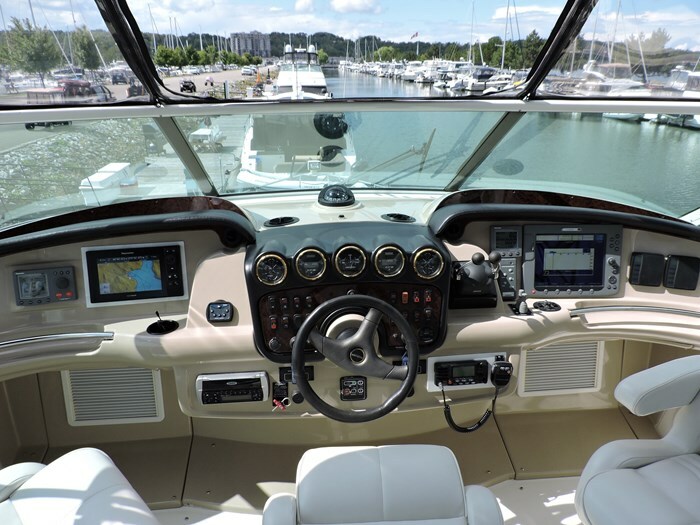 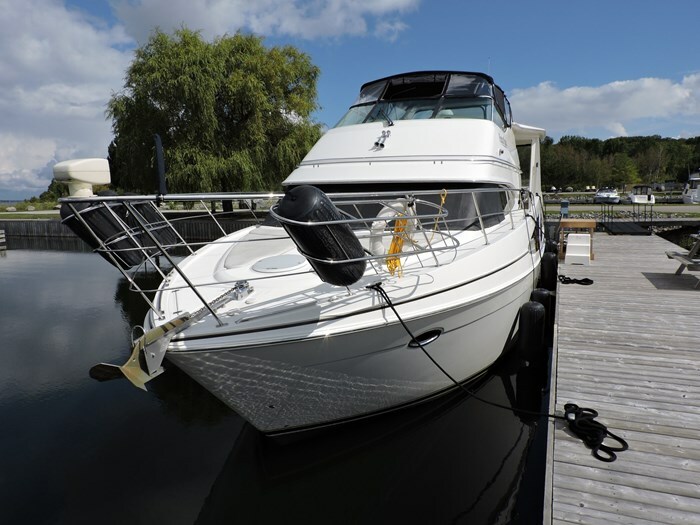 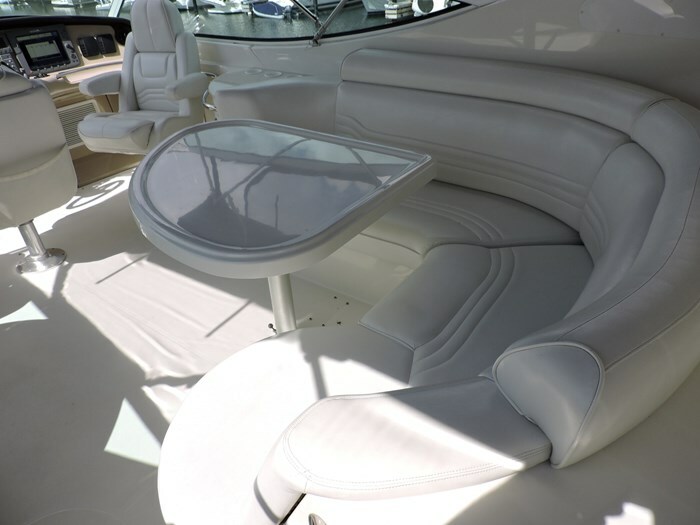 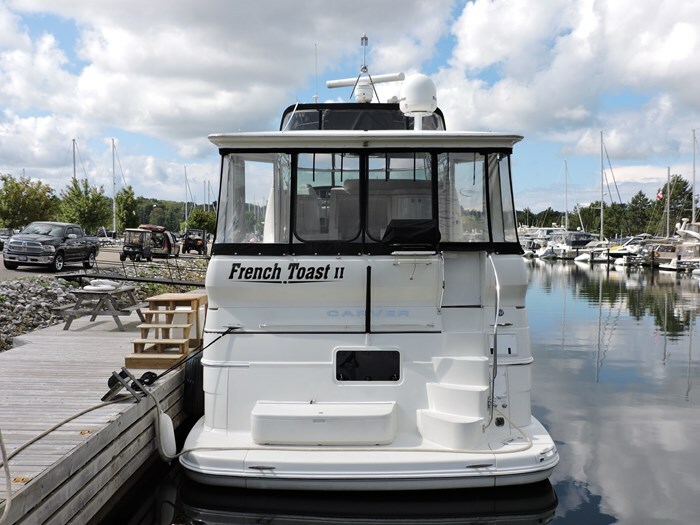 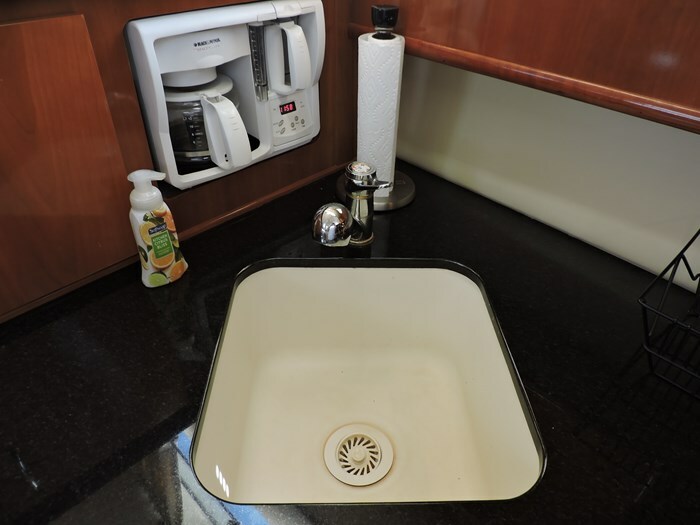 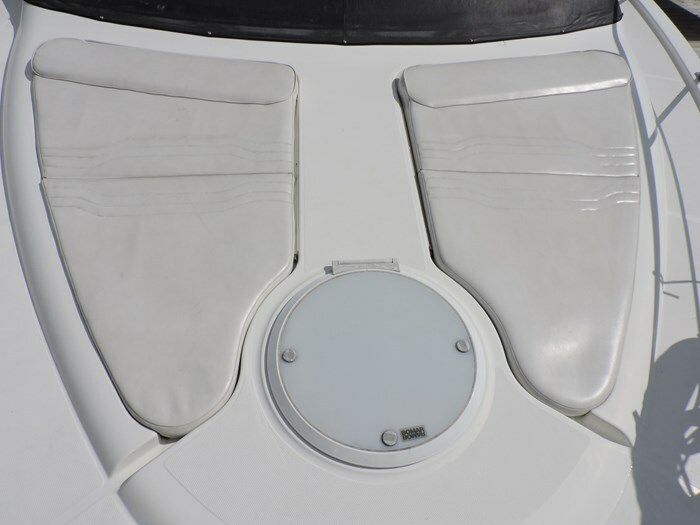 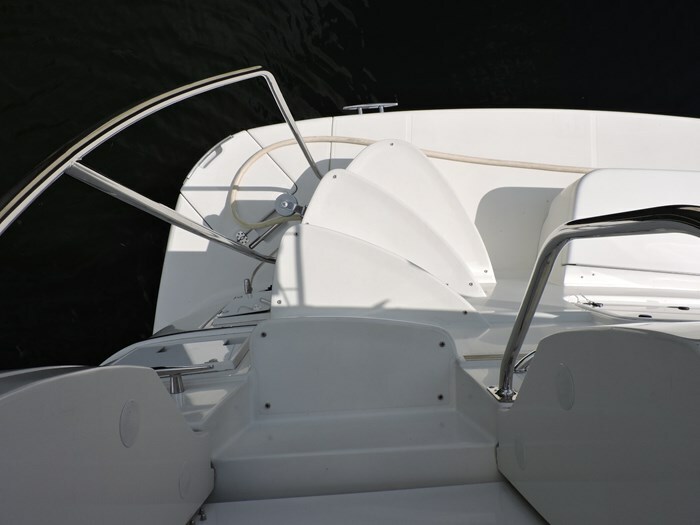 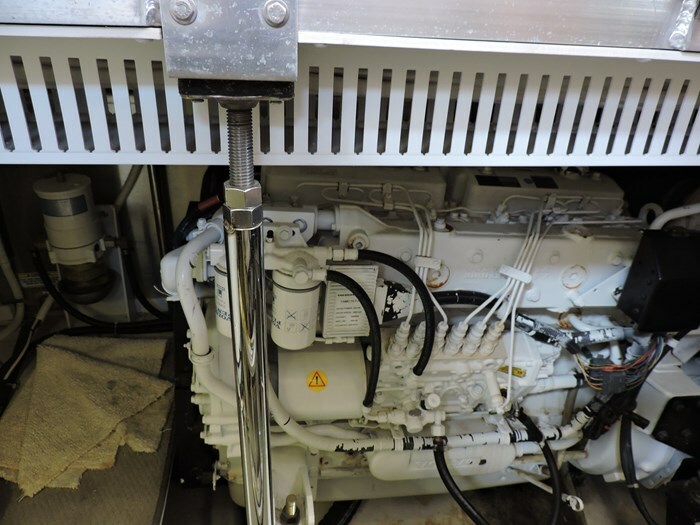 This vessel has had excellent care and maintenance by knowledgeable marina professional staff. 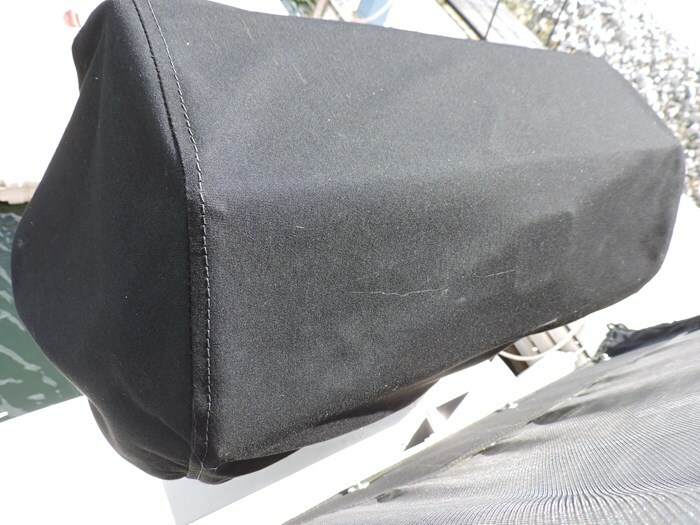 The Canvas top was replaced in 2012. 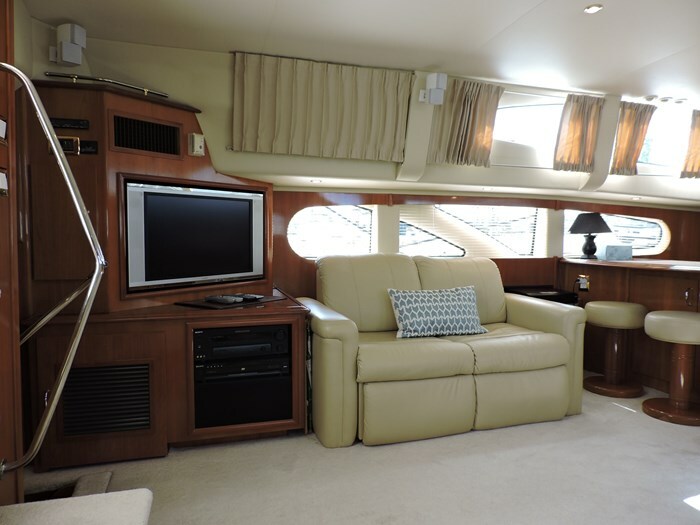 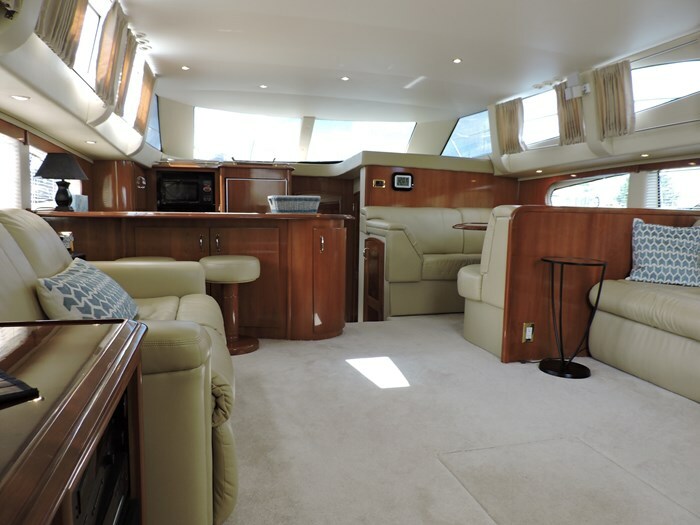 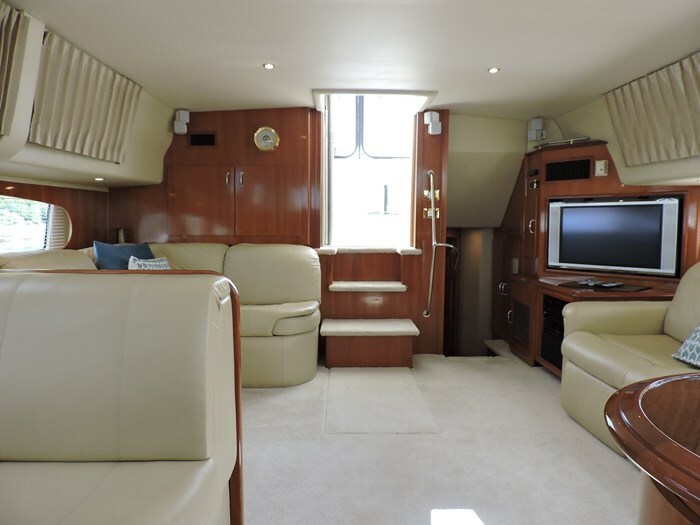 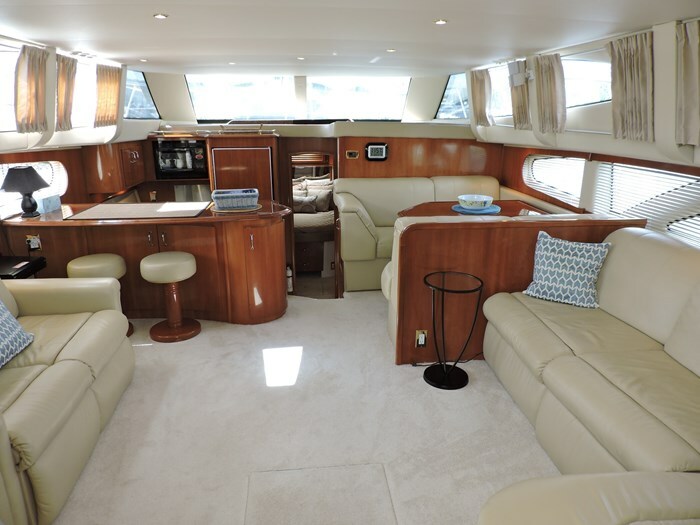 If you are looking for comfort and the ability to accommodate a large family or just want a roomy luxurious yacht, this is your yacht.